Today Zaragoza is a bustling and expanding city with a population of around 800,000 inhabitants. As its urban development continues to grow it is now spreading out on both sides of the river Ebro. Thanks to its solid industrial background, buoyant commercial aspect and a first-class hotel infrastructure, Zaragoza has become an ideal centre for conferences, trade fairs and congresses. This is also aided by its strategic position at the centre of the main provincial capitals. t is a city which now looks to the future but without turning its back on its glorious past. 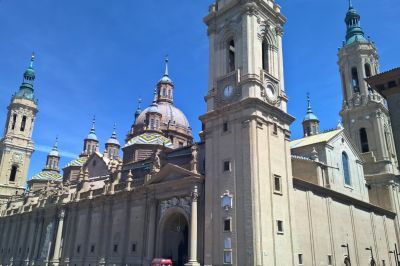 Baroque architecture in Zaragoza can be seen in the Basilica of Nuestra Señora del Pilar, the Churches of Santa Isabel, San Felipe, San Carlos Borromeo and others. Your private English-Speaking Official Specialist Guide will meet you in the lobby of your hotel or at a designated meeting point if you are not staying in a city centre hotel. Starting off with a panoramic walking tour of Zaragoza´s important monuments. We have reserved a table for you lunch either before or after the tour at a recommend restaurant. Now that I am back in London, I thought I would take the opportunity to thank you for the tour that you arranged for my friend and me in Zaragoza. In particular, I wanted to let you know what an excellent job Jorge, our local guide, did on the day. He is clearly extremely knowledgeable about the history and culture of Zaragoza and of Spain in general, and had also done his homework on our special interests so as to make the tour that much more interesting and enjoyable. His English was excellent, and his helpful and friendly personality ensured that the experience was a pleasure as well as being educational.